Approximate range of Deptford culture at maximum extent, 500 BCE - 200 CE, with Atlantic region in red and Gulf region in gold. The Deptford culture (800 BCE—700 CE) was characterized by the appearance of elaborate ceremonial complexes, increasing social and political complexity, mound burial, permanent settlements, population growth, and an increasing reliance on cultigens. Site 8LE484 on the northern shore of Lake Miccosukee, Leon County, Florida. The sites in Leon County represent significant inland Deptford period sites. Early Deptford ceramics appear to have been developed in Georgia around 2,600 years ago out of the Early Woodland Refuge phase (near Savannah), and spread north into South Carolina and North Carolina and south into Florida. Deptford ceramics continued to be made and found on Middle Woodland sites in the southeastern U.S. until about 600 BCE. 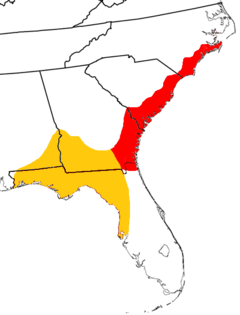 Occupation for the Atlantic coastal plain of Georgia and the Carolinas seems to have followed a seasonal pattern of winter shellfish camps on the coast, then inland occupation during the spring and summer for deer hunting, and fall for nut gathering. From the Early through the Middle Woodland periods, the extensive, low-lying coastal environment of the South Atlantic coast, stretching from North Carolina to northern Florida, was used by numerous Deptford hunter-gatherer bands who lived seasonally within a variety of ecosystems and took advantage of seasonally available foods. Along the Gulf Coast, the Deptford culture continued the seasonal existence throughout the Middle Woodland. Settlements in this geographical area lacked permanence of occupation, although the cultures here participated in the Hopewellian trading network to a limited extent and constructed numerous low sand burial mounds. These sand burial mounds along coastal Georgia and Florida (noted at Canaveral National Seashore and Cumberland Island National Seashore, for instance), as well as in the Carolinas, are believed to represent local lineage burial grounds rather than the resting place of an elite individual. In northwestern Florida, the Early Woodland Deptford culture evolved in place to become the Swift Creek and Santa Rosa-Swift Creek cultures. (Milanich 1994, p. 142) Trade items recovered from burial mounds include copper panpipes, ear ornaments, stone plummets, and stone gorgets. 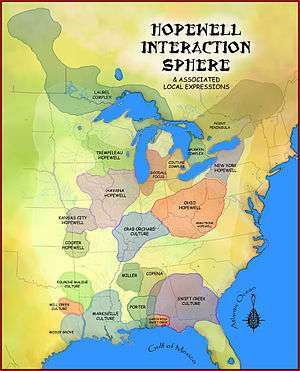 These show this area's incorporation within the Hopewellian Interaction Sphere by about 1,900 years ago. ↑ Keith, Matt. "Letchworth Fieldschool: Introduction to Regional Prehistory". Tallahassee, Florida: Florida State University Department of Anthropology. Archived from the original (Word Document) on July 24, 2011. ↑ "Hawkshaw". University of West Florida Division of Anthropology and Archaeology. Retrieved 16 May 2012. Milanich, Jerald T. (1973). "The Southeastern Deptford Culture: a Preliminary Definition" (PDF). Bureau of Historic Sites and Properties. 3: 51–63. Retrieved 14 May 2012. Milanich, Jerald T. (1994). Archaeology of Precolumbian Florida (Paperback ed.). Gainesville, Florida: University Press of Florida. ISBN 0-8130-1273-2.